Michael prepares and prosecutes patent applications for innovations in the chemical, electrochemical, metallurgical, and mechanical arts. Corey Beaubien and Mike Druzinski co-authored an article "The Supreme Court Gets Intellectual: A Look At How The Court Is Reshaping IP Law In Significant Ways." Michael prepares and prosecutes patent applications for innovations in the chemical, electrochemical, metallurgical, and mechanical arts. His specialties include next-generation alternative energy technologies like fuel cells, lithium ion batteries, and hydrogen storage and delivery systems. 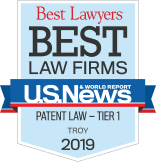 Michael also prepares and prosecutes trademark applications, assists in patent infringement and evaluation studies, and provides research and litigation support for a wide range of IP matters. Michael graduated with honors with a Bachelor of Science in Chemical Engineering from Michigan State University, and he received his Juris Doctor degree from the Wayne State University Law School. During law school, he served as executive articles editor for the Wayne Law Review, where he managed the scholarly content of the review’s quarterly publication and organized its annual legal symposium. He is a member of the American Intellectual Property Law Association and the Michigan Intellectual Property Law Association.